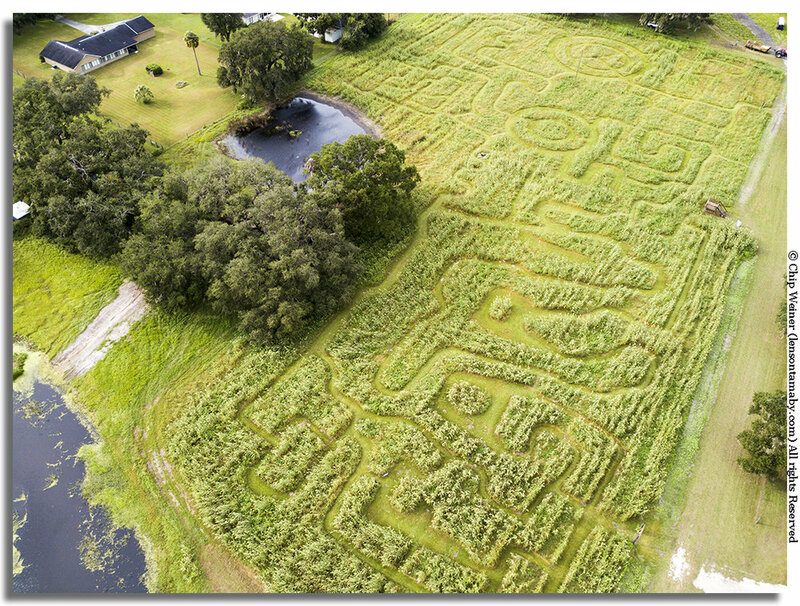 Remember that line in Field of Dreams when "Shoeless" Joe Jackson asks Ray Kinsella, “Is this Heaven?” That’s what flashes in my mind as I step out of my car at the 7th annual Fox Squirrel Corn Maze on the Single R Ranch in Plant City, Florida, about 30 minutes east of Tampa. Hints of mesquite from a barbecue fire waft in a cool breeze that sways the corn field in front of me. I hear children laughing and music in the distance and I feel strangely settled, like I just walked into my own fantasy backyard. It is indeed a thin slice of heaven. Folks at the ticket booth welcome me with a warm southern drawl. Behind them, under a canopy of huge oak trees, lies a grassy area speckled with exhibit tents and picnic tables bordered by a pumpkin patch and that Iowa-like field of corn. A bluegrass band picks away and sings in harmony and it feels like I've come home. It must be fall. Look at these gorgeous gourds, part of the pumpkin patch. Pumpkins are available for purchase, painting, slinging, or just enjoying. When the owners give me permission to launch my drone for an aerial shot I half expect to see a baseball field in the middle of it all. I’m not disappointed when there’s no diamond, but thrilled at the design of the maze which includes the State of Florida and several other graphics cut into the corn rows. Maybe they need to add a helicopter ride to the mix. It’s a shame that most people will never see the detail of this “crop circle” type design. Good food is a part of any hometown celebration. 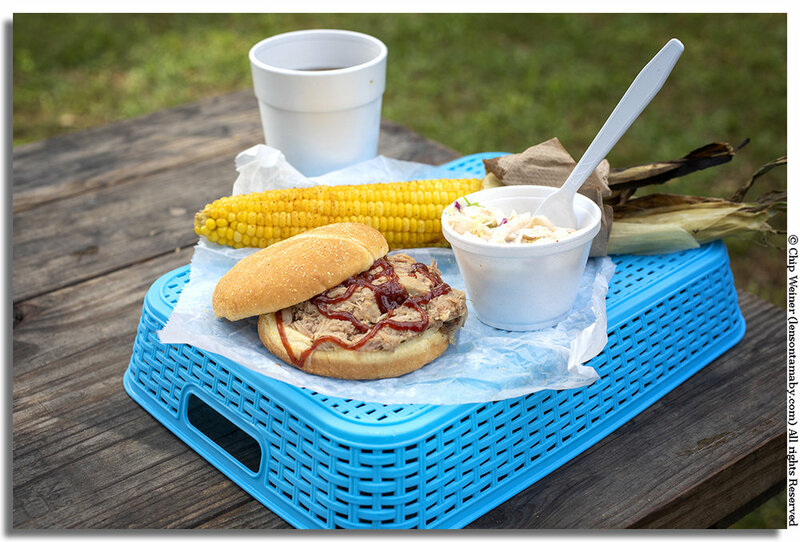 A barbecued pulled pork sandwich, coleslaw, and a fresh ear of grilled and buttered corn on the cob along with some sweet tea are just some of the delish viddles being offered here. Don't forget the kettle corn, lemonade, and baked goods (which are tucked away behind the country store). Pucker up. !This bovine shows a little bit of country love while kids feed her hay. You've not lived until you've been kissed by a cow. I am struck by the simplicity of it all. It's an escape. It's a portal to a simpler time of being outdoors with friends and neighbors enjoying life on life's terms. Everyone is friendly and says hello. There's no political rancor or divisiveness here. There are no demands of emails and schedules and other chaos. Video games are traded in for hayrides, horseback riding, and even pumpkin slinging. It's good people having good fun away from the complexity of everyday city life. Yeah, kind of heaven. 5-year-old Jackson of Plant City makes his own rubber duck race using an old time pump. It's just plain simple fun. Wesley from Dunedin tries his skill with the pumpkin sling. Several yards away scarecrows are set up as targets. Whether you hit one or not doesn't really matter. It's just cool slinging pumpkins! There's corn in that there sandbox. Kids get a play area of their own inside the enclosed screen porch and country store. Check out the little girl at the top making a corn angel! I wanted to try it out but if your over 6-years-old forget it. What's more country than a hayride into the pasture and scrub? Hayrides, horseback riding, and other activities are available for an additional nominal fee. Several farm animals are at the maze, like this billy goat, for first time get-close encounters. See and feed a variety of butterflies in the butterfly tent. You can try your hand at macro photography like this or just learn more about these delicate and necessary creatures. There's all kinds of nature shots waiting for you in the maze. Here a lubber enjoys a sunflower. It's one of the benefits of being in the country. Kick back, relax, and observe what's going on around you. Take your time. That's what gets the best photographs! Here's where the Fox Squirrel Corn Maze at the Single R ranch starts. It's waiting for you. Put down the phone, pack your camera and the kids, and take a break in the country. Eat some food, play some games, and relax! Set a spell. You need it! You deserve it! Celebrate the fall season…. There’s something for just about everyone. Don't forget to check out the arts and crafts vendors as well. (BTW most are cash only and there is no ATM on site) . Be sure to bring your camera and plan to spend a couple of hours exploring. Come on, let go! Eat some food, play some games, and try your hand at navigating the maze. Sit and watch the band or just ponder life under those gorgeous oaks. Admission: Cash, visa, master card & discover accepted for admission only. Fox Squirrel Corn Maze is open October 13th through October 28th Saturday and Sunday’s only. Gates open at 10 a.m. until 5 p.m. Guests are asked to exit the venue by 6 p.m.